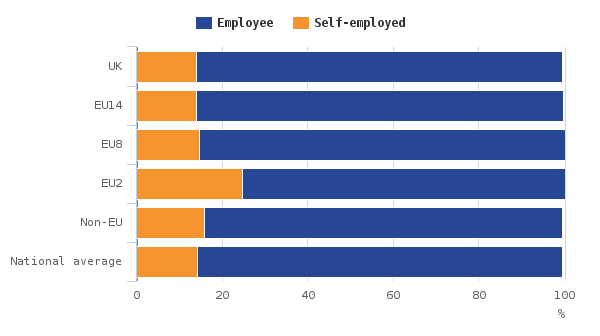 One of the many anomalous statistics we have called out over the years was the fact that 56% more Romanian workers are self-employed than any other nationality group, see here for details. We also went further and identified the link between declaring low self-employment income and paying no income tax or national insurance but claiming full in-work benefit entitlements. At no point have we ever seen central or local government bodies or the press raise this issue in the public domain yet last week we found within a Greater Manchester Combined Authority Economy, Business Growth & Skills Overview & Scrutiny Committee document from 09/03/2018 the following statement “New benefit rules came into effect in April 2016, designed to reduce the high volume of Jobcentre Plus claimants who were declared in work (in self-employment) but who were earning so little through their businesses that they were claiming large amounts of Tax Credits. The rule changes mean that Jobcentre Plus undertake more checks to ensure that people are ‘Gainfully Self Employed’” Amazingly people are still able to continue this practice for twelve months before having their benefits stopped. As to be expected from the Labour Party controlled GMCA they are more troubled by the failure of these self-employment businesses after a year than they are about system manipulation from many self-employed who clearly have found a fraudulent means to access benefits.